I recently took a freelance job where a MultiSite WordPress install. The MultiSite network consisted of three sites. The main site was the main subscription site samplesite.dev that is a couple of conversion pages and a signup form. Two blogs blog-one.samplesite.dev & blog-one.samplesite.dev were also required that will get readers and drive traffic and subscriptions to the main site. 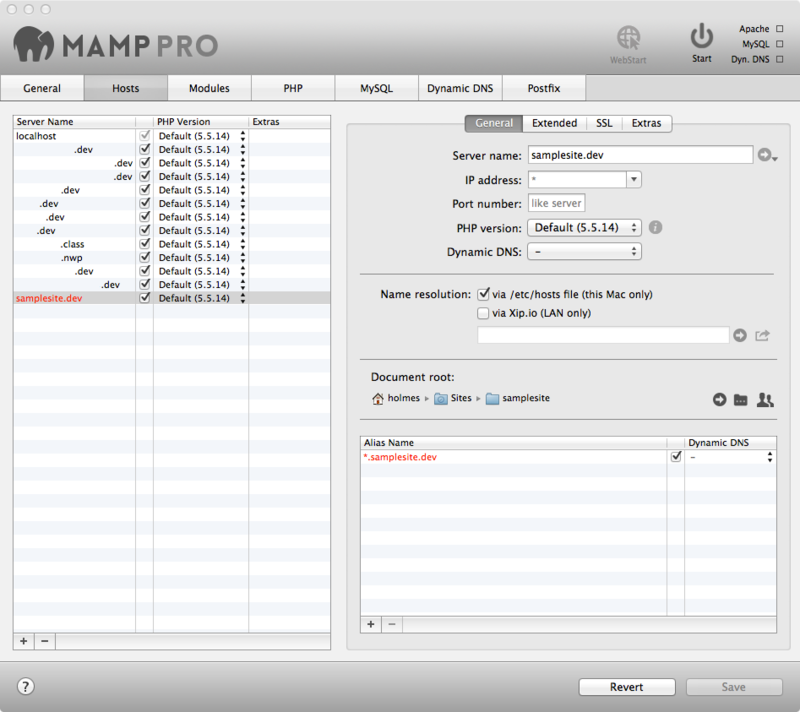 My current development setup includes MAMP Pro as my local development server. I wanted to keep my current setup while working on this site but for the life of me I could not get MAMP Pro to accept a wildcard for the sub-domain. As you can see above the domain and sub-domain shows up red, indicating that there is an error and the wildcard won’t work. I searched around a bunch of blogs and other websites and came up empty with answers on how to make a wildcard domain work. I ended up asking a few friends from the WP518 meet up group. One of them pointed out that instead of adding a wildcard, which as far as I can tell is not possible, to add each sub-domain individually. The image above shows that this worked! This solution is not scaleable at all because you first have to add the site through the WP admin interface and then add it in MAMP Pro. However if you have only a few subdomain sites to build and test, this seems to be the easiest way to set it up with MAMP Pro.